The Clarke-Hobbs-Davidson House, acquired by the Masons in 1958 (at which time a rear brick wing was added, doubling the size of the building), is one of the most imposing historic residences remaining near downtown Hendersonville. The two-and-a-half brick transitional Queen Anne-Colonial Revival style house, built about 1907, stands in nearly unaltered condition, and the brick addition made to the rear of the house soon after 1958 affects the integrity only of the rear elevation of the house. The two-story brick addition, of utilitarian design with metal casement windows and a flat roof, fortunately is relatively inconspicuous from the street, and does not therefore prevent the Clarke-Hobbs-Davidson House from retaining sufficient integrity to be listed in the Register. The house is located on a narrow city lot on the north side of West Fifth Avenue. A high retaining wall, of the same rough-quarried stone used in the house foundation and porch posts, encloses the front yard along the front and sides, with wide steps ascending to the porch in the center of the front yard. The symmetrical (south) facade features a one-story, full-width, hipped roof porch supported by rough stone foundation posts on which rest paired and, at the corners, tripled Doric colonnettes with boxed eaves. The double leaf front door has paneled lower halves and glazed upper nalves, set in a molded surround, with a stone lintel. Large one-over-one sash windows with stone sills and lintels illuminate the entire house. A bay window projects from the center bay of the second story facade, resting on the porch roof, and a large pedimented dormer window projects from the roof above it, giving a pronounced central axis to the main facade. Identical dormers project from the east and west sides of the roof. The walls are laid in red pressed brick in running bond. The tall deck-on-hip roof is covered with asphalt shingles, and the deck probably originally had a railing that is now gone. The deck and the boxed eaves of the dormers have simply molded brackets. Two interior chimneys with corbeled caps project from the tall hipped roof. The only major alteration on the exterior of the Clarke-Hobbs-Davidson House is that the roof eaves and the window surrounds have been covered with aluminum siding. On the east side, in the center second floor bay, is an unexpected touch of Queen Anne whimsy: an oriel window with a wide brick stepped base and a row of three bowed sash windows. The interior of the Clarke-Hobbs-Davidson House, featuring a center hall plan, two rooms deep, exhibits extensive ornate natural oak woodwork and retains a high degree or integrity. All of the door and window surrounds have five-part robustly molded frames. All of the original doors feature narrow horizontal panels. The entrance hall is completely wainscotted, and just beyond a pair of Doric colonnettes on paneled bases, a transverse stair hall intersects on the west side with a closed string dog leg stair with a landing, with heavy newels, turned balusters, and a molded handrail. At the rear of the center hall is an inglenook with a brick fireplace, original mantel, and flanking benches. The two most elaborately finished rooms on the first floor are the parlor, the front right room, and the dining room behind it. Both rooms have paneled wainscotting. The parlor has the most elaborate mantel in the house, with tall Ionic colonnettes supporting an high shelf and mirrored overmantel. Arched niches flanking the fireplace hold built-in cabinetry and a doorway to the dining room. The dining room features a deeply coffered ceiling and built-in cabinetry. Woodwork on the second and third floors is a slightly reduced version of the first floor finish. The Masons have created a new bathroom on the second floor and added a few closets, but otherwise the original structure is unaffected by its adaptive reuse as a Masonic Temple. According to the Henderson County Deed Book 53, p. 344, Charles S. Clarke and wife Louise bought the 105’ by 148.5' Broad Street (later 5th Avenue) lot for $1,050.00 from J. A. Maddrey on January 23, 1906. 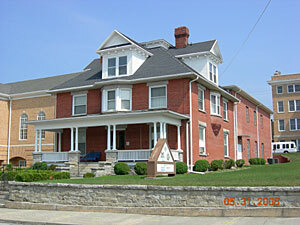 In March, 1907, Charles Clarke sold the property to his wife Louise for $5,000.00 (Henderson County Deed Book 58, p. 94). Possibly there was some sort of domestic upheaval at this point, since the deed book records separate notarized forms for the Clarkes, his in Pennsylvania, hers in North Carolina. The house probably was built by the Clarkes since, despite the March 1907 sale, both the Clarkes are listed on the deed transferring ownership to Alfred J. Hobbs of Connecticut on May 6, 1907 for $11,000.00, a substantial increase in value (Henderson County Deed Book 57, p. 114). 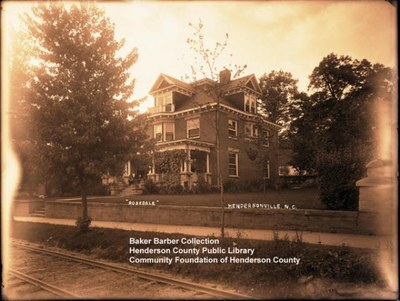 Later that year, the house once again was sold, this time to Charles A. Hobbs and wife Harriet G. of North Carolina (Henderson County Deed Book 57, p. 278). The price did not change. Four years later, the Hobbs sold the house, "being the lot on which now stands the brick house known as the Charles A. Hobbs residence, together with all the furniture and fixtures now in said house," to Mrs. Ada S. Davidson for $8,000.00 (Henderson County Deed Book 71, p. 95, June 1, 1911). Mrs. Davidson (later Ada S. Rose) left the property to her brother Edgar Sutton and wife Eleanor (Henderson County Record of Wills 1928-1935, vol. 7, pp. 229-231). On November 4, 1932, the Suttons sold the house, "being same lot conveyed by Charles A. Hobbs and Harriet to Ada S. Davidson," to Roy and Catherine Noble for "$10.00 and other valuable considerations" (Henderson County Deed Book 203, p. 147). In 1937, the Nobles still resided in the 5th Avenue house (Hendersonville City Directory 1937/38). On April 29, 1958, R. J. Swackjamer bought the house for $22,500.00 and gave it to the Masons, Kedron Loge #387 (Henderson County Deed Book 367, p. 305).